A native of Florence, Alabama, W.C. Handy (1873-1958) was a songwriter, arranger, music publisher, and folklorist who became known as the “Father of the Blues.” One of the most important American songwriters between 1910 and 1925, Handy introduced Blues into mainstream popular culture by writing down and combining fragments of melodies and words, turning these into complete written compositions, and disseminating them via sheet music, performances, and recordings. 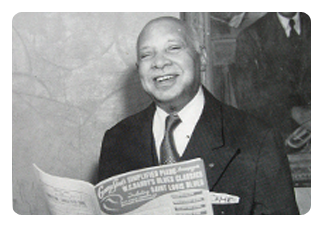 William Christopher Handy was born on November 16, 1873 to Charles Bernard Handy and Elizabeth Brewer. The son and grandson of ministers, Handy was discouraged from taking part in secular music but was exposed to it through neighborhood musicians in his early years. After earning a teaching certificate from Huntsville Teachers Agricultural and Mechanical College (now Alabama A&M University) where he would later teach, Handy briefly worked for Bessemer Iron Works but the musical itch stayed with him. He later began traveling with different bands and minstrels where he journeyed from Mississippi and landed in Memphis, Tennessee, a city filled with aspiring musicians. While in Memphis, Handy was commissioned to write a campaign song for mayoral candidate Edward Crump. The song, “Mr. Crump,” swept the city and Crump won the election. Three years later, Handy transformed the song into “Memphis Blues” which he published himself in 1912 with his publishing company, Pace & Handy Publishing Company, partnering with businessman Harry H. Pace. Handy and the company relocated to New York in 1917. Between 1914 and 1921, Handy produced a string of hits including “Yellow Dog Blues,” “Joe Turner Blues,” “Aunt Hagar’s Children Blues,” and “Beale Street Blues.” His masterpiece, “St. Louis Blues,” is the most recorded composition in history. Handy co-wrote the film “St. Louis Blues” starring Bessie Smith. He died in Yonkers, New York on March 28, 1958 at the age of 84. Approximately 150,000 people honored Handy at his funeral service.